Purple Loco is a member of the Pea Family. It grows to 16 inches in height and has grayish, hairy, leaves which grow to 12 inches in length with leaflets that grow in pairs along the leaf to 1.5 inches in length. 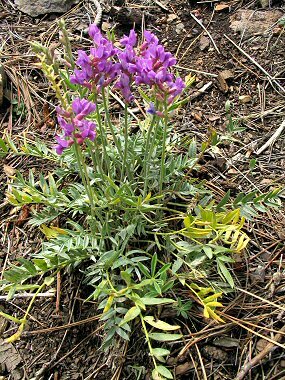 The plant typically grows in clearings in pine forests at elevations between 5000 - 8000 feet. Purple Loco is toxic to livestock. 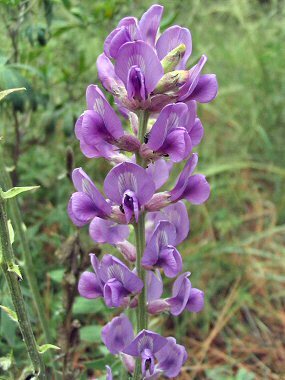 Purple Loco typically blooms between June - September and produces clusters of purple, pea-like flowers to 1 inch in length followed by a leathery pod to 1.25 inches in length.